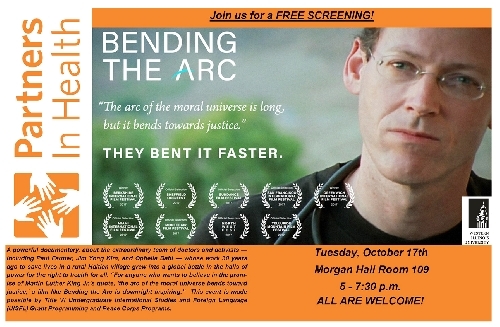 MACOMB, IL – A screening of the film "Bending the Arc" will be held from 5-7:30 p.m. Tuesday, Oct. 17 in Morgan Hall, 109. The documentary tells the story of how a three-member team of doctors and activists worked to save lives in the rural Haitian village and how that 1980s battle grew into a global event for the right to health care for everyone. The event is made possible by the Title IV Undergraduate Internatioanl Studies and Foreign Language (UISFL) grant programming and the Peace Corps Programs. The event is open free to the public. For more information about the screening, visit wiu.edu/sao/outreach/film.php.